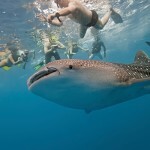 Enjoy a private expedition to live an extraordinary day coexisting with the whale sharks in style on a private yacht. 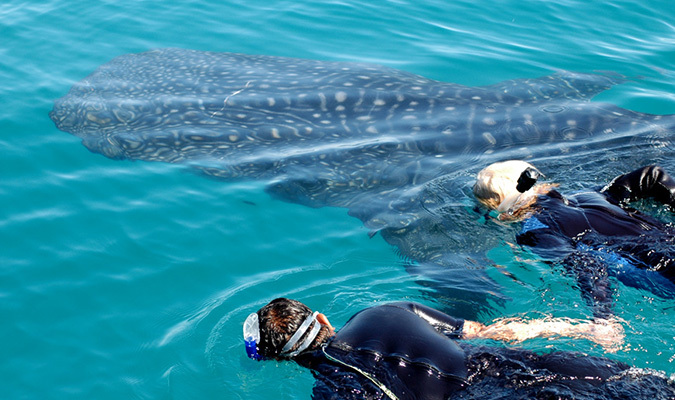 Every year from June to Septemeber, the whale sharks surrounding Isla Mujeres and Cancun allow all the lovers of the marine world to enjoy an unforgettable experience. To swim close to the biggest fish in the world may be done in a few places such as Australia and Belize, however the area between Isla Mujeres and Isla Contoy is the most privileged because it gathers one of the largest whale shark populations. The presence of this creature in the summer is primarily between Contoy Island and Holbox Island – although in the past years we have encountered more species towards the Caribbean Sea and Isla Mujeres – is due to the large amount of nutrients that is found in this part of the Caribbean. Accompanied by an expert, guests will receive the necessary information to understand whale shark behavior and once acquainted they will be able to get off the boat with a certified guide to swim beside them Whale sharks are completely harmless to humans. 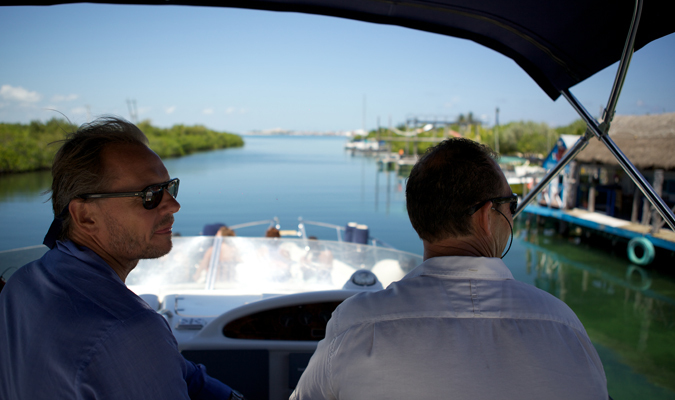 You will be picked up at your hotel by your dedicated guide and transferred to the private Cancun marina where you will be boarding your 60 foot Sunseeker Predator Yacht. This yacht is equipped with three cabins and three bathrooms and a mid‐sized interior living room with air, as well as a shaded area where you can sit comfortably. Upon arrival you will be served fresh juices, bagels with salmon, fresh fruits, and an assortment of cereal. You will meet your expert guide en route – he will join you when you make your transfer from the yacht to a private authorized speed boat which you will be using to visit the whale sharks. 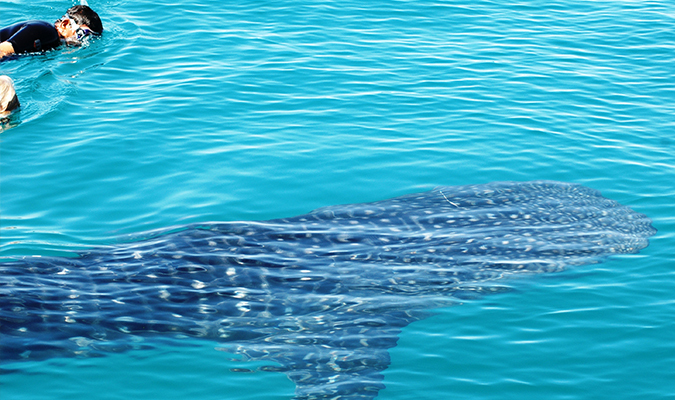 (Note: Only small, authorized fiberglass boats are allowed for swimming with whale sharks). 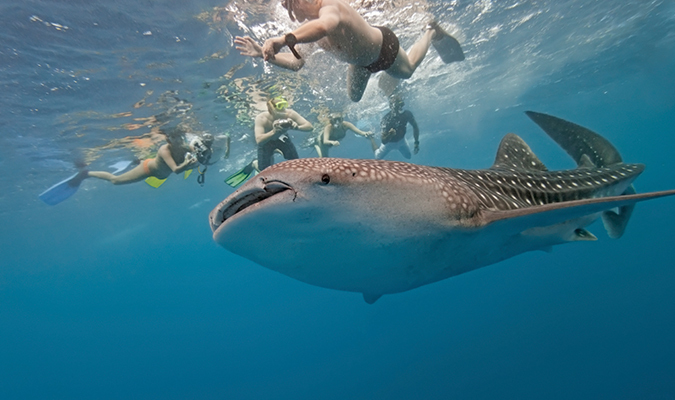 During the ride, the guide provide you with all the necessary information regarding the whale shark activity. 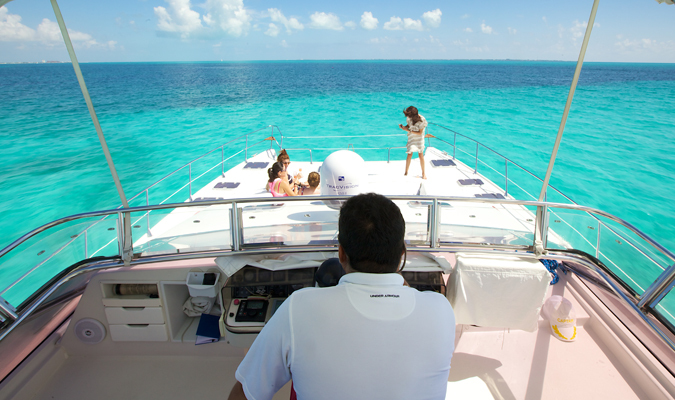 Once you are finished you will be saying good bye to the speed boat and get back on to your private yacht and sail to Isla Mujeres where you will be enjoying an a la carte lunch at one of the best beach clubs of the islands. The best months to observe and snorkel with these fantastic animals are July and August. 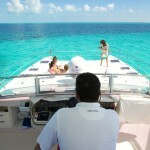 The use of private chartered yachts will allow you maximum flexibility. 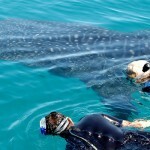 The use of private boat and guide will allow you maximum flexibility and opportunity to interact with the whale sharks. You will be able to jump in several times during one tour for the chance to get an upclose and personal encounter with these creatures. 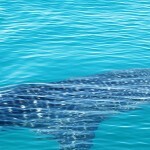 This whale shark tour is completely private which allows less wait times.